When I walked past Marie Lake on my first trip I knew that I would camp here the second time…and I did! A thru-hiker will climb Cathedral Pass and Island Pass as well, but they are far less dramatic, and many hikers don’t even know when they’ve arrived at the top. Most of the major passes have signs announcing that you have reached the top—which are superfluous—while the minor passes go unsigned. That is too bad; a sign telling me where Cathedral and Island passes actually are would be useful! The eleventh pass is Trail Crest, on the way down to Whitney Portal, after summiting Mount Whitney. Technically, it isn’t on the JMT. Which brings me back to the big eight. Rest at the Bottom. The primary objective of my first thru-hike was to finish. Sure, I intended to stay safe and leave no trace, but all other considerations were relegated to secondary importance compared to finishing the hike. With that in mind, and with the passes (especially the last four, which I would tackle in four consecutive days) casting a long shadow over my limited self-confidence, I was determined to give myself the best chance to make it over each pass. That meant two things: sleep at as low an elevation as possible the night before, because, generally, the lower I slept the better I slept, and avoid climbing at the end of the day, when I was most spent. That’s exactly what I did. In all but two cases I spent the night before a pass at the lowest point within a day’s hike (for me). This plan worked great! In each instance I made it over the passes handily. It was a great psychological boost to know that the afternoon miles were often going to be all downhill. The only drawback was that on a couple of occasions—Glen Pass and Forester Pass—I didn’t reach the top until early afternoon. Fortunately, the days were thunderstorm-free. Getting There Early. My priorities for the second thru-hike were different. I knew that I could hike the miles; this time I was determined to enjoy the experience a little more. Part of “enjoying the experience a little more” was camping at spots that I had walked past the first time. Many of those spots, like Marie Lake and the Rae Lakes area, happened to be close to the tops of passes. With one thru-hike behind me, and with a little more self-confidence on this second trip, I decided that a climb in the afternoon, even if I was a bit worn out, wasn’t so bad. I even finished one day with the Golden Staircase! The additional benefit was that I was off the pass early, which was good, because I had thunder, lightning, rain, and even some snow and hail the second time around. Which way is right? I’d be hard pressed to call either one “wrong.” Still, next year, you’ll find me at the top of the major passes early in the day. At least for me, getting to the top early is the way to go. 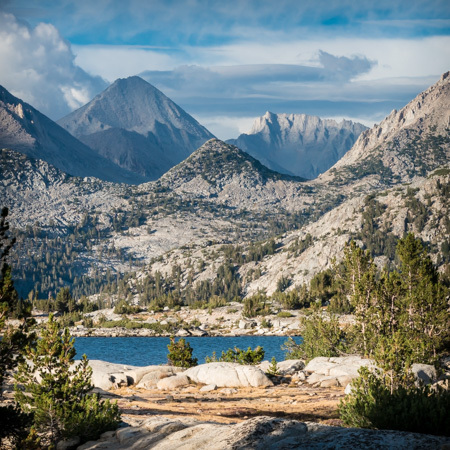 You always have great and wise advice for the aspiring JMT traveler! What if snow is anticipated on the passes? Since wilderness safety is what Mountain Education is all about, most of these details are found on the school’s website/Facebook pages, but a “nutshell” of info will get hikers started! Two principles to remember: Hard snow is slippery. Soft snow will bog you down and “post-holing” can be dangerous. Going along with those two principles are issues of timing: If I go up the pass before 10am, the snow may still be hard and slippery. If I wait and hit the top after noon, I may be suddenly sinking in (post-holing) on the way up and down and that is not only fatiguing, but may cause injury, but I probably won’t have slippery footing to worry about! In general, with footwear that will grip the snow (boots, hiking crampons, self-arrest poles, etc. ), we find after 32 years of teaching sierra snow-hiking skills, that dealing with firm snow is safer and more predictable than wallowing through soft, afternoon, post-holing, exhausting slush…and the glissades down the back sides are more fun! It doesn’t matter whether you are on 8 inches or 8 feet of consolidated snow, you deal with it the same way. The hazards of a small “drift” across the trail are no different to deal with than those the size of a football field. The main point is to learn how to be safe on snow before you encounter it. A hastily planned trip that doesn’t explore and prepare for the possible sorrows and sufferings will only end up with both! Great comments, Ned. Thanks for posting! I enjoy your comments, book and video and plan to hike the JMT with my wife next August, 2015. Do you have any wisdom you can share about the psychological aspects of the hike? What is the best way you found to “use your mind” while hiking, when fatigued, or when things get a bit hairy to maximize your enjoyment? Thanks for the kind words, Paul. My best advice to husband and wife teams (my wife and I have hiked significant portions of the trail together) is here: http://jmtbook.com/john-muir-trail-hiking-the-trail-with-your-spouse/. In regards to the psychology of the hike, the first hurdle is realizing you can do it. That may take a few days, but at some point you will realize that, barring injury or really bad weather, there is nothing to prevent you from finishing. That leaves the second hurdle: making sure you take the time to enjoy the good stuff so that it more than makes up for the fact you are walking constantly, are getting dirtier every day, and are not eating the tastiest stuff. That’s why I encourage taking advantage of TM, Red’s and MTR. It gives you some time to get off the trail and recharge. The “3 Rules” you devised are golden, indeed, Ray. We’ve been fortunate to agree, appreciate, and apply them each time we’ve gone trekking over the past year including a JMT thru hike in June. I printed a copy and carry it with all other essential paperwork (maps, permits, etc.). I agree with Colin Fletcher (author of the then-groundbreaking 1000 Mile Summer and Man who Walked thru Time) who said that the most common mistake among new backpackers is walking too fast. It is surprisingly hard to make yourself walk slowly enough on ascents at altitude with a pack (of any weight). The goal is to get to the top breathing easily enough to carry on a conversation without pauses for breath (the classic test is the ability to say the pledge of allegiance or the Lord’s Prayer without pauses). It is easier to reach a miles per day goal by keeping miles per hour low. The Southbound fastest known time, unsupported, was set at an average pace under 2.7 miles per hour (but many hours per day). If you are not trying to set a speed record you should be way, way slower than that. One of the things I really like about carrying a digital barometric altimeter on my wrist is the ability to set have it display the rate of climb and use that information to pace myself. At the start of a climb I zero it out and it starts counting off minutes and feet. (It reports rate of climb also, but mostly I just check the feet and the minutes since the last re-set to zero). I find a steady pace of about 10 feet of climb per minute is a good pace for me once I am a few days into a hike — others will chose more or less. Mostly I use it to make myself slow down – if I start climbing too fast I know I will tire too easily. If the pack is particularly heavy (lots of food) or early in the hike I want to stay well under the 10 feet per minute. If I find myself getting short of breath I know that I need to pay more attention to the pace — I’ll reset the altimeter interval register to zero and try to hike at a lower climb rate. Most digital barometric altimeters will allow this (check the owner manual for how to do it). GPS altimeters sometimes don’t do this as well as the barometric ones as they give more erratic elevation readings over short intervals. Suunto makes good digital barometric altimeters and the lowest-end ones work fine and are often less complicated than the more elaborate models. Great point, John. I would only add that what you have written is particularly true when one is eating too few calories (which most of us do). Slow and steady is vastly preferable. Thanks!